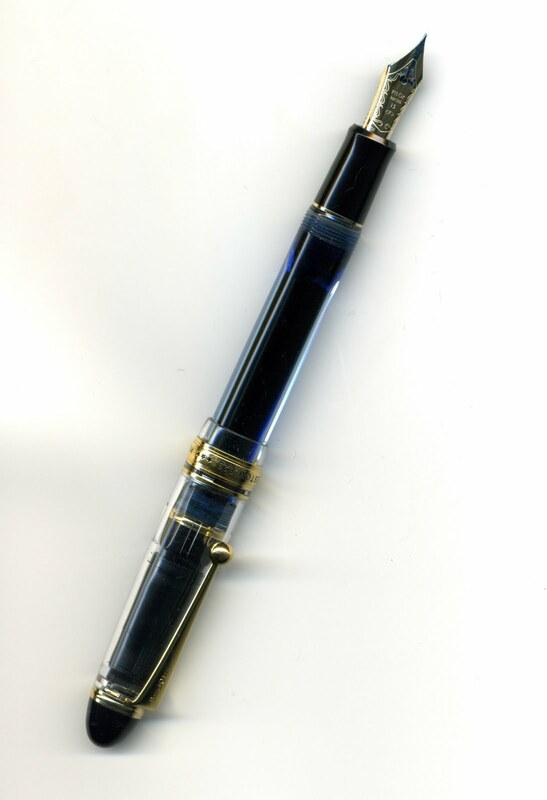 Just as Passion at The Pen Archives could marry JetPens, I have an enduring love for Namiki fountain pens. I had read about Namiki years ago in a fantastic book by Florence Scovell Shinn, a well-known illustrator from the turn of the 19th century through the 1920s, and an equally well-known New Thought practitioner through her death in 1940. (New Thought would be roughly analogous to what we now call New Age, with a lot of focus on prosperity and abundance practices) Mrs. Shinn wrote in one of her books that she bought a Namiki fountain pen, probably in the 1920s, and every year on the anniversary of her purchase she would receive a letter from the company asking after the pen. Such dedication impressed her, and me as well, and so I had to have a Namiki. But which one? I first saw the Namiki Custom 823 Clear Demonstrator at the 2009 NYC Pen Show while browsing Swisher Pens. According to Chuck Swisher and several other Namiki retailers, only 100 of the pen sets (the Custom 823 Clear Demonstrator with the Iroshizuku ink in Kon-Peki) had been shipped to the US. I saw several at the Pen Show, but took a better look a few weeks later at the Art Brown International Pen Shop Fair where I fell in love with the Clear Demonstrator and the Amber Demonstrator. But at that time I wanted a fine nib, and the Amber only had a medium nib. So I chose the Custom 823 Clear Demonstrator, in it's elegant sateen-linked box and complimentary bottle of Iroshizuku Kon-Peki ink. It's a complicated pen, which I didn't realize at the time I bought it. The sales rep neglected to mention that the tail plug needs to be unscrewed in order to send ink through to the feed. Several times I ran out of ink and couldn't figure out why, until one of the StyloForum folk helped me out. Filling the converter is also an interesting experience, combining my natural clumsiness with my aversion to putting the nib and feed all the way into the bottle of ink. With the Namiki Custom 823, the nib and feed turn quite easily and can be (gently) pulled out of the section, leaving the barrel with the converter open and able to put the ink in using an eyedropper and gloves. For me, inking up this way is much easier although the first two times I didn't wear gloves, and that Iroshizuku ink is unforgiving in its pigmentation and tenacity on the skin--doesn't wash off, it wears off after several days. This fountain pen can hold a lot of ink, and given that it's a clear barrel and cap the ink you choose really becomes a part of the whole visual experience. I'm wondering what the pen would look like with Diamine Pumpkin or Noodler's Widowmaker in the converter, how that much bright orange or red would look in the pen. The 14k fine nib is a joy to write with, it just glides over the paper without the scratchiness or tooth that I've had with one or two other pens. There are a few irritants, perhaps the only one that's noticeable is that there is some ink creep on the nib which leaves small drops inside the cap (the cap actually has a black lining down most of the length so ink drops don't show, but some ink does get into the clear area and is easiy seen). Also, I've noticed when cleaning out the ink that the barrel does retain a slight blue color; as I was immediately adding more Kon-Peki, I didn't see whether this was a permanent coloring of the clear barrel or just a temporary situation. But I will say that the Namiki Custom 823 Clear Demonstrator is worth every penny, and is now my special "go to" fountain pen. Besides the 823 Clear and Amber pens, Namiki will be introducing an 823 Smokey color sometime early next year, and I'm looking forward to seeing that one. I've been toying with the idea of buying this pen for a while. It's a "plunger" of "vacuum" filler and as an owner of a Sheaffer with that filling system appeciate the vast ink capacity and cool filling experience. I think Namiki is the only pen company to currently offer a filler of this type. After reading your review I really want the pen even more! Ack! Yes, TAO, there's something about this pen that just makes your want it. A seller on ebay is currently offering the Smokey/Black version for much, much less and I am so tempted to hit the BIN tab! I think Visconti has this filling system as well so I will correct myself. Hmmm...so it's on Ebay, eh? This pen does not have a converter. The barrel is the ink chamber. Why don't you just use the plunger filler like it was meant to be used? Anonymous, as I explained I'm not wild about putting the entire feed into a bottle of ink. I don't like how much ink gets behind the nib as there is then a constant flow that gets all over the paper and my hands. And I'm not wild about how long it takes to pull up ink into the barrel using the plunger system. As the nib and feed can come out of the system, and I have an eyedropper and gloves handy, I find my way of filling works for me. I've never cared how someone fills a fountain pen as long as they love and use them. More than a few people use a syringe to fill a barrel or converter since it's neater and easier for them. Not everyone wants inky hands like I get! LOL! Actually, it's a lot easier on the nib to fill a pen this way. One doesn't need to wipe the point afterward and the two-tone plating on some nibs will last a lot longer without the friction. Just LOVE all that detail. You are certainly passionate about your pens and ink aren't you? My line of work gives me a sort of sideways look at pens, in that we brand them for our clients. The best bit is we get to play with loads of samples so we can recommend the best ones. Info, that sounds wonderful. I find that the few times I actually need a ballpoint I can't find one anywhere. A problem I don't think you have, lol. Hi it's me, I am also visiting this site regularly, this web page is genuinely fastidious and the viewers are in fact sharing nice thoughts. Need a Stocking Stuffer? Get a Little Something.